Road trips ... a popular summer genealogy research activity! With the kids out of school, warmer (if not hot) temperatures, and July 4th on the horizon – it’s time for a Road Trip! A genealogy or family history oriented one. Many of us piggy-back, when possible, a genealogy research or a “let’s visit where the ancestors lived” trip with a vacation. We are already on the road traveling, we might even have built-in research buddies traveling with us, or it’s an opportunity to share with the family some of the more interesting bits of the family history as we visit the cemeteries where they are buried, the churches they attended, possibly the houses where they lived, etc. If you are not planning a road trip yourself, you may find that a local genealogical society is planning one! The Iowa Genealogical Society recently did a road trip to the Midwest Genealogy Center (Kansas City). Speaking of the Midwest Genealogy Center, read Planning for a Trip to any Genealogy Library, Specifically Midwest Genealogy Center (Genealogy Decoded) – the article has great tips for any research trip, regardless of destination! Maybe hearing from someone who recently took a genealogy road trip will inspire you to embark on your own. Read Genealogy Road Trip (Mid-Continent Public Library website) or Genealogy Road Trip! (Christine Bell, LDS Blogs). As a person who loves to drive, I always find road trips fun. Not everybody feels the same way (my husband is very glad that I like to drive as he doesn’t!). 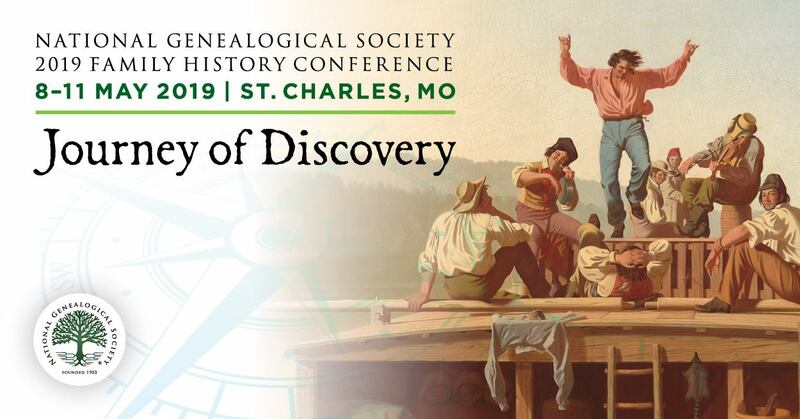 So, if you don’t like to drive, find a road trip buddy or take advantage of a planned trip set up by a genealogical group or similar (there are still openings for the fall NGS SLC trip (Unfortunately the Fort Wayne and DC trips are both sold out. Check this page for all NGS research trip offerings). If you absolutely cannot physically get to where you want to visit you might find photographs posted by others (both modern and historic) or be able to take advantage of the Google street view feature to “virtually” travel to a locale that you would love to see. Are You Using Historic Editorial Cartoons As You Research Your Ancestors, Community, or a Time Period? Sometimes we get information from unexpected places – or shall I say less usual places. For example, with all the complexity of modern politics, a nice single panel editorial cartoon will often tell me more than the two page article in the newspaper. As we research our ancestors, we are often seeking to learn more about the context of the times in which they lived. What better way than through editorial cartoons!??! This came to my mind when I read Teaching with Editorial Cartoons (ProQuest). Of course, then I had to see if there are collections dedicated to editorial cartoons and there are quite a few! I'm sure there are more ... If you know of any other large collections, let us know. So, when you next need to learn some history and brevity will best suit your needs, consider checking out a collection of editorial cartoons. Do you know of another type of resource that puts history into bite-size digestible chunks? Editor's Note: My family are particular to The Cartoon History of the Universe series by Larry Gonick. Thanks to everyone who emailed, posted on Google+ or posted on FB responses to: Informal Poll -- What kinds of genealogy and family history news do you like to read? If you haven’t yet responded, please do so! Your comments, thoughts and suggestions are always welcome. I have read every response so far received and I will re-read them in a few days as I “plot and plan” future posts. As you may know, Upfront with NGS Mini Bytes has been a platform for periodically sharing “eight tasty bits of genealogy news that will help give you a deeper byte into your family history research.” Many of these bits of information are about new resources (databases, websites, etc). This feature has been a vehicle for sharing “more” news than can be handled by the blog’s a piece-a-day format. It has also allowed the blog to share news of a more localized nature (a local archive, a database for a particular emigrant group, etc) which may not be of interest to everyone and yet of immense interest to some of our readers. To create this feature, many, many genealogy newsletters, blogs and news outlets are monitored and yet, it’s not possible to bring attention to everything that crosses our desk nor can I spend the time to read every genealogy-related newsletter, blog post or news outlet in existence. + Would you be willing to help contribute to this piece by passing news items along to us that you haven’t seen reported on? We love to share news and would be happy to credit your contribution. + Are you happy with the variety and brevity of the pieces? + Do you have any suggestions? Again, your input as dedicated Upfront with NGS readers is invaluable to ensuring that the blog remains a part of your regular reading routine. Informal Poll -- What kinds of genealogy and family history news do you like to read? I’d like to informally poll, you, the readers of Upfront with NGS, about what type of blog posts interest you the most. Meaning – these are the posts that you are more likely to read. You have a choice of many many blogs to read to get your information from. We recognize that no one blog can possibly give you all the family history news that is relevant -- after all, our community is quite diverse and there is a lot of news that could have relevance. With that in mind, what types of posts keep you coming back to Upfront with NGS ? Please post a comment to the blog post, or comment on FB or Google+, or send an e-mail to [email protected] with your responses. Times change, people’s needs/interests change, and it’s always good to get a sense of what’s important to the community. Here is a list of some types of blog posts, besides those related to NGS news, in no particular order. Do NOT feel limited by this list (I know it’s not comprehensive). You can always share ideas for other topics of interest. ... and, many more topics. Again, what types of blog posts do you enjoy and/or value reading! Thanks in advance for your input. Ancestry.com has announced that it is discontinuing the following offerings as it focuses on its core business. We’re proud of the variety of products we’ve created over the years that enable people to discover, preserve and share their family history. We recognize that there are a lot of ways that we, as a company, can make family history easier, more accessible and more fun for people all over the world. And we’re continually innovating to make it a reality. We’re always looking to focus our efforts in a way that provide the most impact, while also delivering the best service and best product experience to users. To that end, we’ve decided to retire some of our services: MyFamily, MyCanvas, Genealogy.com, Mundia and the Y-DNA and mtDNA tests. We will note that the AncestryDNA (autosomal) test is not affected by this change and will continue to be available as we continue to invest in this new technology. Only the y-DNA and mtDNA tests will be retired. Starting September 5, 2014, these services will no longer be available to access. Genealogy.com is the exception to the rule, and will continue in a slightly different form. If you are an active member or subscriber to one of these services, you will be contacted directly with details of how to transition the information you’ve created using these services. We know these services have provided value to you. We think they’re pretty cool too, which is why this wasn’t an easy decision for us to make. In the end, it came down to priorities and we think our core offerings are a great place to spend our time and resources. So here’s to revolutionizing family history, focusing on providing the best product experience we can offer and to the limitless possibilities that lie before us. Editor’s Note : Due to the recent DDoS attack on Ancestry.com, you may or may not be able to access the original announcement or Ancestry.com websites at any given time. If you cannot, try again in the future.